ISIS Going Rogue in Turkey, or Is It? Excerpt of article originally published under the title, "Turkey: ISIS's Hostage Again." 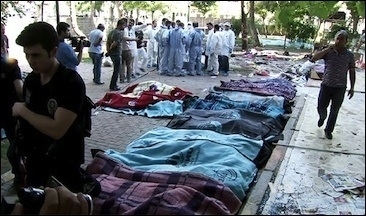 In March 2014, Turkey's main opposition social democratic party submitted a parliamentary motion to investigate alleged failings of safety standards at a coalmine in Soma, in western Turkey. The ruling Islamist party's parliamentary majority voted to reject it. Less than two months later the same coalmine exploded, killing more than 300 miners. In February 2015, an opposition member of parliament, Nazmi Gur, from the pro-Kurdish People's Democratic Party (HDP) filed a parliamentary motion, asking for an inquiry into the activities of the Islamic State (IS, ISIS) inside Turkey. The next day, the motion was rejected by the same government benches, leading Gur to decry the vote as "a sign that the Turkish government still refrains from taking a clear position against ISIS." Half a year later, an IS suicide bomber murdered 32 people in an attack against a pro-Kurdish gathering, in a Turkish town bordering Syria. IS has mainly targeted foes of the government — Alevis in the 2013 Reyhanli bombing, and Kurds in four separate attacks. Turkey's covert relationship with the IS, which has captured larges swaths of land in Syria and Iraq since last summer and declared an Islamic Sharia caliphate in the lands it controls, can be described by words ranging from "clandestine support" to "distant Islamist comradeship," and from "malign neglect" to "defensive caution." But overall, it was self-destructive miscalculation. The Turks did not understand what kind of distant ideological comrades they were dealing with when these comrades last year took hostage 49 Turkish personnel at Turkey's consulate in Mosul, Iraq's second biggest city, including the consul general. Following secret negotiations and under terms never disclosed, the hostages were released unharmed after 101 days of captivity. Apparently, Turkey promised cautious and more covert support for the Islamic State in return for an IS promise not to commit acts of terror on Turkish territory. 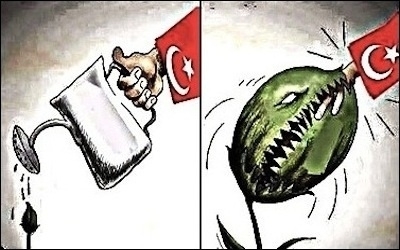 However, as Turkey came under increasing pressure from its Western allies to do more against the jihadists, and after Turkey showcased dozens of potential jihadists detained while crossing the Turkey-Syria border, that deal began to crack, and has now become null and void. Thus, the recent attack in an obscure corner of Turkey should come as no surprise. Previously, Turkey offered covert support for IS in return for its promise not to attack Turkish territory. In March 2014, three Islamic State jihadists killed two security officers and one civilian, and injured eight, when they opened fire on a checkpoint manned by gendarmes and police in Nigde, in central Turkey. Three suspected attackers, along with eight others, were arrested and are on trial, with the prosecution demanding three life sentences for each. Police reports found links between the suspects and a Syrian Turkmen, Haisam Toubaljeh (or Heysem Topalca in Turkish), who is allegedly linked with radical groups, including IS. Toubaljeh is also a suspect in the "Reyhanli case," in which a 2013 bomb attack in the southern Turkish town of Reyhanli (on the Syrian border) killed more than 50 people. In May, shortly before Turkey's parliamentary elections, the Islamic State targeted two provincial buildings of the pro-Kurdish HDP party, injuring eight. One IS bomb arrived as a package delivery and the other as a bouquet of flowers. An Islamic State suicide bomber murdered 32 people and wounded more than 100 others in a July 20 attack on Kurdish humanitarian activists in Suruc, Turkey. And only two days before the elections, on June 5, a Turkish IS militant detonated a bomb at an HDP election rally in Diyarbakir, the unofficial "Kurdish capital" in Turkey's predominantly Kurdish southeast. Five people were killed and over 100 injured. Then came the July 20 suicide bomb attack in Suruc, a small Kurdish town on the Turkish side of the Turkey-Syria border. The 32 murdered victims were mostly young Turkish and Kurdish leftists organizing humanitarian assistance for Kobane, a nearby Kurdish town on the Syrian side of the border. The bomb left more than 100 people injured. Interestingly, with the exception of the Mosul hostage crisis and the police checkpoint shooting, all Islamic State attacks on Turkey have so far targeted President Recep Tayyip Erdogan's ideological/political foes: mostly Alevis in the Reyhanli bombing and the Kurdish political movement in four separate bomb attacks. Note that it was the Kurdish political movement that on June 7 dashed Erdogan's dreams to introduce an executive presidential system.